The city of Squamish is home to both natural and man-made beauty. So much so, that people come from far and wide to hike, swim and photograph the area. Between tourists and locals, maintaining an inviting environment is key to community pride as well as a thriving economy. A little bit of graffiti might not seem like a big deal but each and every paint stain sets the tone for your community. Whether it is a residential or commercial property, our Squamish graffiti removal can help you send the right message. Often times, graffiti vandalism can be offensive and even when it isn’t, it is not always pleasant to look at. Squamish residents work hard for their properties, first to purchase them and then again to keep them running smoothly. There is nothing more annoying than working for something only to have someone else wreck it. That is exactly what graffiti artists do. With one push of a finger, these taggers strip down your work. A lot of graffiti in a neighbourhood can drive property values down, ruin the facades of standing buildings and invites more graffiti. Street artists are competitive so it is no wonder that one design will invite more. Your Squamish graffiti removal might not seem like an time-sensitive issue but the longer that you hesitate, the more chance you have of a larger problem. Graffiti does not just come in one solid chunk. In fact, because of their can design, spray paints leave behind overspray and paint bleeding as well. If you are looking for a complete clean on your property, it will take a well-rounded approach. Our Squamish graffiti removal treats not only the main design but the area surrounding it as well. Treating the exterior of your property is a customized job. Gorilla technicians use eco-friendly tools, our Gorilla brushes, pressure washers and even the occasional paint brush in order to get the best results for your property. 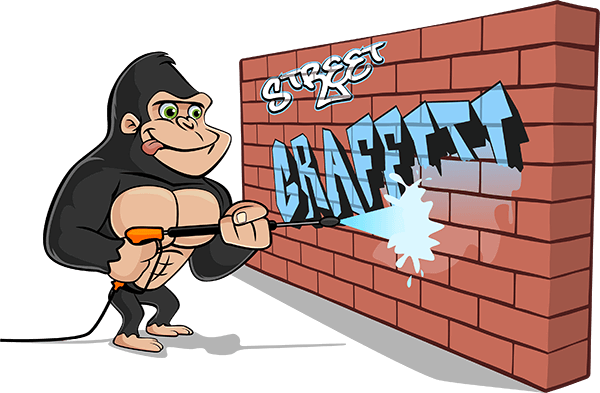 If your home or business has been struck by graffiti vandalism, don’t hesitate to call in a Gorilla. Our Squamish graffiti removal can accommodate your space – usually in the same day!